Mutations in Kv7.2 (KCNQ2) and Kv7.3 (KCNQ3) genes, encoding for voltage-gated K+ channel subunits underlying the neuronal M-current, have been associated with a wide spectrum of early-onset epileptic disorders ranging from benign familial neonatal seizures to severe epileptic encephalopathies. The aim of the present work has been to investigate the molecular mechanisms of channel dysfunction caused by voltage-sensing domain mutations in Kv7.2 (R144Q, R201C, and R201H) or Kv7.3 (R230C) recently found in patients with epileptic encephalopathies and/or intellectual disability. Electrophysiological studies in mammalian cells transfected with human Kv7.2 and/or Kv7.3 cDNAs revealed that each of these four mutations stabilized the activated state of the channel, thereby producing gain-of-function effects, which are opposite to the loss-of-function effects produced by previously found mutations. Multistate structural modeling revealed that the R201 residue in Kv7.2, corresponding to R230 in Kv7.3, stabilized the resting and nearby voltage-sensing domain states by forming an intricate network of electrostatic interactions with neighboring negatively charged residues, a result also confirmed by disulfide trapping experiments. Using a realistic model of a feedforward inhibitory microcircuit in the hippocampal CA1 region, an increased excitability of pyramidal neurons was found upon incorporation of the experimentally defined parameters for mutant M-current, suggesting that changes in network interactions rather than in intrinsic cell properties may be responsible for the neuronal hyperexcitability by these gain-of-function mutations. Together, the present results suggest that gain-of-function mutations in Kv7.2/3 currents may cause human epilepsy with a severe clinical course, thus revealing a previously unexplored level of complexity in disease pathogenetic mechanisms. Epileptic encephalopathies (EEs) are clinical conditions in which epileptiform abnormalities contribute to progressive disturbance in cerebral function; three main features characterize EEs: epileptic seizures (often poorly responsive to pharmacological treatment), EEG abnormalities, and various degrees of developmental delay. Genetic research in the past two decades has identified several EE genes and provided novel hints into disease pathogenesis (Cross and Guerrini, 2013); however, how mutations in specific genes contribute to the severity of the epilepsy phenotype is largely unknown (Striano et al., 2013). Mutations in Kv7.2 (KCNQ2) and Kv7.3 (KCNQ3) genes, encoding for voltage-gated K+ channel subunits underlying the neuronal M-current (IKM) (Wang et al., 1998), are responsible for early-onset epileptic diseases with a widely diverging phenotypic presentation. Earlier studies revealed that Kv7.2 (Biervert et al., 1998; Singh et al., 1998) or, more rarely, Kv7.3 (Charlier et al., 1998) gene defects are responsible for benign familial neonatal seizures (BFNSs), an autosomal-dominant epilepsy of newborns. BFNS-affected patients suffer from recurrent seizures that begin in the very first days of life and remit after a few weeks or months, with mostly normal interictal EEG, neuroimaging, and psychomotor development. Following several reports questioning the benignity of the clinical course in BFNS patients (Steinlein et al., 2007), de novo missense Kv7.2 mutations have been more recently found in neonates affected with pharmacoresistant seizures, distinct EEG and neuroradiological features, and various degrees of developmental delay, defining a “Kv7.2 encephalopathy” (Weckhuysen et al., 2012). Subsequently, de novo missense Kv7.2 mutations have been also shown as one of the most common causes of early-onset EEs, including the Ohtahara syndrome (Saitsu et al., 2012; Kato et al., 2013), the most severe and earliest developing age-related EE. Functional studies have revealed that BFNS-causing mutations decrease IKM conductance, and a 25% reduction in Kv7.2/3 currents appears sufficient to increase neuronal excitability to epileptogenic levels in early infancy (Jentsch, 2000); animal models appear to confirm such conclusion (Singh et al., 2008). More dramatic functional deficits have been found in channels carrying mutations associated with more severe epileptic phenotypes (Miceli et al., 2013; Orhan et al., 2014). In the present work, mutagenesis, electrophysiology, biochemical, multistate modeling, and computational modeling techniques have been used to investigate the molecular mechanisms underlying disease pathogenesis by three voltage-sensing domain (VSD) mutations in Kv7.2 (R144Q, Allen et al., 2013; R201C, Weckhuysen et al., 2013; and R201H, Carvill et al., 2013) or Kv7.3 (R230C, Rauch et al., 2012; Allen et al., 2013) recently described in patients with EE and/or intellectual disability. Together, the results obtained reveal that all four these mutations stabilize the activated state configuration of the VSD, suggesting that, in addition to a loss-of-function (LOF), a gain-of-function (GOF) mechanism in Kv7.2/3 currents may also cause human epilepsy with a severe clinical course. Mutagenesis and heterologous expression of Kv7.2 and Kv7.3 cDNAs. Mutations were engineered in human Kv7.2 or Kv7.3 cDNAs cloned into pcDNA3.1 by QuickChange site-directed mutagenesis (Agilent Technologies), as previously described (Miceli et al., 2013). Channel subunits were expressed in Chinese Hamster Ovary (CHO) cells from female animals by transient transfection. CHO cells were grown in 100 mm plastic Petri dishes in DMEM containing 10% FBS, penicillin (50 U/ml), and streptomycin (50 μg/ml) in a humidified atmosphere at 37°C with 5% CO2. For electrophysiological experiments, cells were seeded on glass coverslips (Carolina Biological Supply) in 40-mm dishes and transfected on the next day with the appropriate cDNAs using Lipofectamine 2000 (Invitrogen) according to the manufacturer's protocol. A plasmid encoding for enhanced green fluorescent protein (Clontech) was used as transfection marker; total cDNA in the transfection mixture was kept constant at 4 μg. For biotinylation experiments, cells were seeded on 60-mm dishes and transfected with 6 μg of total cDNA. Currents from CHO cells were recorded at room temperature (20°C–22°C) 1–2 d after transfection, using a commercially available amplifier (Axopatch 200B, Molecular Devices) and the whole-cell configuration of the patch-clamp technique, with glass micropipettes of 3–5 mΩ resistance. The extracellular solution contained (in mm) the following: 138 NaCl, 5.4 KCl, 2 CaCl2, 1 MgCl2, 10 glucose, and 10 HEPES, pH 7.4 with NaOH; when higher (50 mm) KCl concentrations were used, the NaCl concentration was decreased accordingly. The pipette (intracellular) solution contained (in mm) the following: 140 KCl, 2 MgCl2, 10 EGTA, 10 HEPES, 5 Mg-ATP, pH 7.3–7.4 with KOH. The pCLAMP software (version 10.0.2) was used for data acquisition and analysis. Linear cell capacitance (C) and series-resistance (RS) calculation, were performed as described previously (Soldovieri et al., 2007). All illustrated and analyzed currents were corrected offline for linear capacitance and leakage currents using standard subtraction routines (Clampfit module of pClamp 10). Current densities (expressed in picoamperes per picofarad) were calculated as peak K+ currents at 0 mV divided by C. Data were acquired at 0.5–2 kHz and filtered at 1–5 kHz with the 4-pole low-pass Bessel filter of the amplifier. No corrections were made for liquid junction potentials. To generate conductance-voltage curves, the cells were held at −80 mV, then depolarized for 1.5 s from −80 mV to 20/80 mV in 10 mV increments, followed by an isopotential pulse at 0 mV of 300 ms duration; the current values recorded at the beginning of the 0 mV pulse were measured, normalized, and expressed as a function of the preceding voltages. The data were then fit to a Boltzmann distribution of the following form: y = max/[1 + exp(V1/2 − V)/k], where V is the test potential, V1/2 the half-activation potential, and k the slope factor. Activation current traces were fit to a double-exponential function; a single time constant representing the weighted average of the slow and fast components was obtained by using the following equation: τ = (τf Af + τs As)/(Af + As), where Af and As indicate the amplitude of the fast and slow exponential components, respectively, and τf and τs indicate the time constants of these components. Resting membrane potential in CHO cells was determined in current clamp after achieving the whole-cell configuration; recordings were sampled at 10 kHz and filtered at 5 kHz via a 4-pole Bessel low-pass filter. Cell surface biotinylation and Western blotting. Plasma membrane expression of wild-type and mutant Kv7.2 or Kv7.3 subunits in CHO cells was investigated by surface biotinylation of membrane proteins in transfected cells 1 d after transfection using Sulfo-NHS-LC-Biotin (Pierce), a cell-membrane impermeable reagent, as previously described (Borgatti et al., 2004; Castaldo et al., 2004). Following cell transfection, biotinylation, and lysis, a fraction of cell lysates were reacted with ImmunoPure immobilized streptavidin beads (Pierce). Channel subunits in streptavidin precipitates and total lysates were analyzed by Western blotting on 8% SDS-PAGE gels using mouse monoclonal anti-Kv7.2 (clone N26A/23, dilution 1:1000; Antibodies Inc.) or rabbit polyclonal anti-Kv7.3 (clone APC-051, dilution 1:1000; Alomone Labs) antibodies, followed by HRP-conjugated anti-mouse or anti-rabbit secondary antibodies (clone NA931V or NA934V, respectively; dilution 1:5000; GE Healthcare). Reactive bands were detected by chemiluminescence (ECL Western Blotting Substrate; Promega). To confirm that the biotinylation reagent did not leak into the cell and label intracellular proteins and to check for equal protein loading, the same blots were also probed with anti-α-tubulin antibodies (dilution 1:2000; Sigma). Acquisition and data analysis were performed by using ImageLab software (version 4.1; Bio-Rad). To study the possible mechanisms through which an increase in Kv7.2/3-IKM function can enhance neuronal excitability, we used a realistic model of a hippocampal pyramidal CA1 neuron taken from a previous work (cell 5038804 from Migliore et al., 2005) (ModelDB a.n. 55035), and whose active and passive properties have already been validated against several experimental findings (e.g., Migliore, 2003; Marcelin et al., 2009; Ascoli et al., 2010). For one set of simulations, we included an interneuron, connected in such a way to implement a feedforward inhibitory microcircuit in which the effects of an excitatory Schaeffer collateral input is modulated by perisomatic inhibition. The model files for the interneuron were taken from a previous work (model DB a.n. 87546) performed to support and explain experimental findings (Minneci et al., 2007). The resting potential was set for both neurons at −65 mV. Biophysical properties of wild-type and mutant Kv7.2/3 currents were implemented according to the experimental findings (Table 1; Kv7.2+Kv7.3 and Kv7.2+Kv7.2R201C+Kv7.3 for wild-type and mutant, respectively). In both cells, IKM was inserted into the soma at the same density, whereas it was threefold higher in the axon of the CA1 pyramidal neuron (Shah et al., 2008). IKM peak conductance at the soma was determined in such a way to be consistent with the peak IKM current measured from whole-cell somatic voltage-clamp experiments (for the hippocampal interneuron and principal cell, respectively: Hu et al., 2002; Lawrence et al., 2006). With our CA1 pyramidal and interneuron model morphologies, and the IKM kinetics implemented with the experimental data obtained, a value of 15 pS/μm2 for both the CA1 and the interneuron resulted in the experimentally observed 1 nA peak value during a simulation of a whole-cell somatic voltage-clamp to 40 mV (from −60 mV) for the interneuron (Lawrence et al., 2006), and 0.6 nA for a voltage-clamp at −20 mV for the CA1 principal cell (Hu et al., 2002, 2007). Under control conditions (i.e., wild-type IKM with a 15 pS/μm2 peak conductance), the interneuron had an input resistance much higher than the principal cell (260 vs 60 mΩ), in agreement with experimental findings (Foster and Dumas, 2001; Lamsa et al., 2007; Zemankovics et al., 2010). To model the synchronous activation of an afferent Schaeffer collateral volley, a single suprathreshold (39 nS) excitatory synaptic conductance was randomly activated (Poisson) at an average frequency of 50 Hz (in the range of the gamma rhythm), on the main apical trunk at 100 μm from the soma. Its kinetics was implemented with a double exponential conductance change (0.5 and 5 ms for rise and decay time constant), and a reversal potential of 0 mV. For the simulations of a microcircuit, the same excitatory input (22 nS) was relayed to the soma of the interneuron with a 3 ms delay. The action potentials of the interneuron were then used to activate an inhibitory synapse (0.5 and 7 ms for rise and decay time constant and a reversal potential of −80 mV) on the soma of the principal cell. Simulations were performed using the NEURON simulation environment (version 7.3; Hines and Carnevale, 1997). Model and simulation files will be available for public download on the ModelDB section of the Senselab suite (http://senselab.med.yale.edu). Three-dimensional models of Kv7.2 subunits were generated by using as templates the coordinates of six different states of Kv1.2/2.1 paddle chimera (PDB accession number 2R9R; 29% of sequence identity with Kv7.2) obtained in molecular dynamics simulations (Jensen et al., 2012). Modeling of the S1-S4 VSD in each state was performed with SWISS-MODEL, as described previously (Miceli et al., 2013). The models were optimized through all-atom energy minimization by using the GROMOS96 implementation of Swiss-PDBViewer and analyzed using both the DeepView module of Swiss-PDBViewer (version 4.0.1; http://spdbv.vital-it.ch/) and PyMOL (http://www.pymol.org/). Data are expressed as the mean ± SEM. Statistically significant differences between the data were evaluated with the Student's t test (p < 0.05). The schematic topology of a single Kv7 subunit and the location of the mutations investigated are shown in Figure 1A. Three of the four mutations affect the second positively charged residue (R2) along the S4 sequence in the VSD of Kv7.2 (R201C, Weckhuysen et al., 2013; and R201H, Carvill et al., 2013) or Kv7.3 (R230C, Rauch et al., 2012; Allen et al., 2013); the fourth, instead, neutralizes the R at the bottom of S2 in Kv7.2 (R144Q, Allen et al., 2013). Both these residues are highly conserved among Kv channels (Fig. 1B). Schematic drawing of a Kv7 subunit and location of the naturally-occurring mutations studied in the present work. A, Topological representation of a single Kv7 subunit. Arrows indicate the location of the mutations investigated (shaded in gray); the negatively charged residues E130 and E140 in S2, and D172 in S3, are boxed in white. A–D indicate the four putative α-helical domains identified in the Kv7 C-terminal region. B, Sequence alignment of the S2 and S4 segments of the indicated Kv subunits (www.ebi.ac.uk/Tools/psa/). Residues are colored according to the following scheme: magenta represents basic; blue represents acid; red represents nonpolar; green represents polar. In transiently transfected CHO cells, homomeric Kv7.2 channels generated time-dependent, K+-selective currents that slowly activate at a threshold potential ∼−50 mV (Fig. 2A). At the holding voltage of −80 mV, the vast majority of Kv7.2 channels were closed; therefore, the ratio between the currents measured at the beginning of the depolarization step (IInstant) and those at the end of the 0 mV depolarization (Isteady-state) was close to 0 (Table 1). By contrast, at −80 mV, homomeric Kv7.2 R201C channels showed an almost complete loss of time dependence in current activation kinetics (Fig. 2A); therefore, the IInstant/Isteady-state ratio was greatly increased (Table 1). Although the G/V curve of Kv7.2 channels was sigmoidal, Kv7.2 R201C currents showed a mostly linear G/V between 20 mV and −80 mV, indicative of a significant loss of voltage-dependent gating (Fig. 2B); a slight degree of channel deactivation could be observed upon membrane hyperpolarization below the holding voltage. In Kv7.2, the replacement of the same R2 residue with an H (R201H) caused a marked hyperpolarizing shift (∼30 mV) in the voltage dependence of current activation (Fig. 2A,B; Table 1). A significant fraction of Kv7.2 R201H channels was open at −80 mV (Table 1). Qualitatively similar but less dramatic functional changes were observed in homomeric Kv7.2 R144Q mutant channels, whose G/V curve was shifted by 20 mV to more negative potentials (Fig. 2A,B; Table 1). 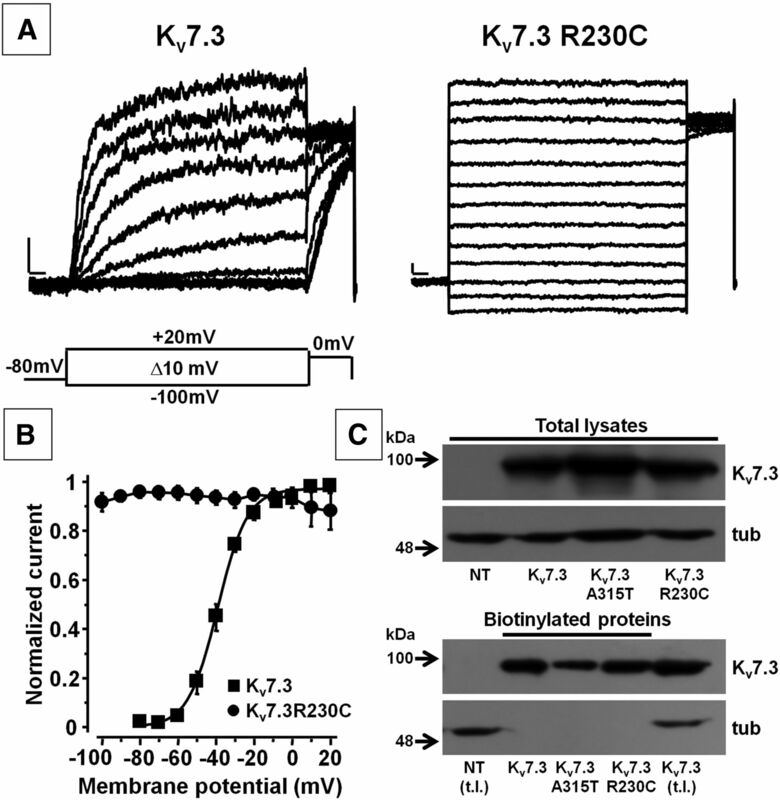 Despite such dramatic changes in voltage-dependent gating, all mutant channels retained their K+ selectivity; indeed, the reversal potential of the currents from Kv7.2 (−79 ± 1 mV), Kv7.2 R201C (−79 ± 1 mV), Kv7.2 R201H (−76 ± 1 mV), and Kv7.2 R144Q (−76 ± 2 mV) channels was close to that of a K+-selective pore (−83 mV under the present recording conditions). Tetraethylammonium (TEA) sensitivity was also unaffected in all three mutant channels (Table 1), confirming that these mutations do not alter pore structure. K+ currents recorded in cells expressing Kv7.2 channels show double exponential activation kinetics, with the fast component (Af) accounting for ∼90% of the total activation process (Soldovieri et al., 2007). Compared with Kv7.2 channels, noninstantaneous currents from Kv7.2 R144Q or Kv7.2 R201H mutant channels displayed similar kinetics in the voltage range between −50 mV and −10 mV; a significant increase in the weighted average of τ was only observed at more positive potentials (from 0 to 20 mV). Indeed, at 0 mV, the weighted average of τ was 103 ± 20, 372 ± 38, and 219 ± 40 ms for Kv7.2, Kv7.2 R144Q, and Kv7.2 R201H, respectively (n = 6; p < 0.05). Functional properties of wild-type and mutant homomeric Kv7.2 channels. A, Macroscopic currents from Kv7.2, Kv7.2 R201C, Kv7.2 R201H, or Kv7.2 R144Q channels, in response to the indicated voltage protocol. The arrows on the voltage protocol indicate the time chosen for current analysis, as explained in the text. Current scale, 100 pA; time scale, 0.1 s. B, Conductance/voltage curves for the indicated channels. Continuous lines are Boltzmann fits to the experimental data. Each data point is the mean ± SEM of 7–20 cells recorded in at least three separate experimental sessions. C, Normalized and superimposed current traces from the indicated channels in response to the voltage protocol shown. Time scale, 0.1 s.
Figure 2C shows a superposition of current traces from Kv7.2, Kv7.2 R144Q, Kv7.2 R201C, and Kv7.2 R201H channels in response to a subthreshold depolarizing pulse of −60 mV, followed by a stronger depolarization to 0 mV. At −60 mV, no current flowed through Kv7.2 channels, whereas significant outward currents could be recorded in cells expressing Kv7.2 R144Q, R201H, and R201C mutant channels. Compared with Kv7.2, homomeric Kv7.3 channels generate currents of smaller size, lower TEA sensitivity, and negatively shifted activation gating (Fig. 3A,B; Table 1) (Wang et al., 1998; Soldovieri et al., 2006). Neutralization of R2 with a C (Kv7.3 R230C) fully eliminated both voltage and time dependence of current gating in the voltage range between −100 and 20 mV (Fig. 3A,B; Table 1), thus producing functional consequences largely similar to those previously described for the corresponding R201C mutation in Kv7.2. The reversal potential (−80 ± 1 mV) and TEA sensitivity (Table 1) of Kv7.3 R230C currents were unchanged compared with Kv7.3 channels. The K+ current density recorded in Kv7.3 R230C-expressing cells was ∼12 times larger than in those expressing Kv7.3; a similar, but less dramatic, effect was also observed when the R201C mutation was introduced in Kv7.2 (Table 1). The increased current size observed in Kv7.3 R230C-transfected cells does not appear to be consequent to a mutation-induced increase in plasma membrane subunit expression. Indeed, Western blot experiments revealed no difference in the ratios between the intensities of the 90 kDa band (corresponding to wild-type or mutant Kv7.3 subunits) and the α-tubulin band (∼55 kDa) in total lysates from Kv7.3- and Kv7.3 R230C-transfected cells; the ODQ3-TOTAL/ODTUB ratios were 1.00 ± 0.16 and 1.15 ± 0.26 for Kv7.3 and Kv7.3 R230C, respectively (n = 3; p > 0.05; Fig. 3C, top). More importantly, the ratios between the intensities of the Kv7.3 band in streptavidin-isolated plasma membrane proteins and in total lysates from the same cells were also identical, as the ODQ3-BIOT/ODQ3-TOTAL ratios were 2.77 ± 0.58 and 2.00 ± 0.62 for Kv7.3 and Kv7.3 R230C, respectively (n = 3; p > 0.05; Fig. 3C, bottom). Plasma membrane expression of another Kv7.3 mutation (A315T), which also markedly increased macroscopic current size (Zaika et al., 2008), was also unaffected (ODQ3-TOTAL/ODTUB were 0.75 ± 0.20; ODQ3-BIOT/ODQ3-TOTAL were 1.46 ± 0.83; n = 3; p > 0.05 vs Kv7.3) (Fig. 3C), confirming that most homomeric Kv7.3 channels are functionally silent but may be unlocked into a conductive conformation by specific mutations. 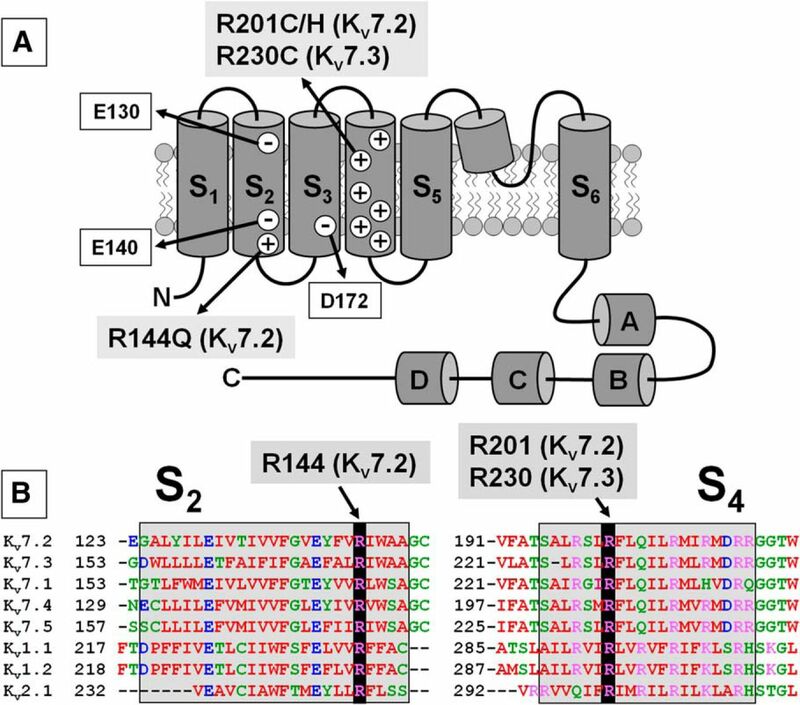 Functional properties of homomeric Kv7.3 and Kv7.3 R230C channels. A, Macroscopic currents from Kv7.3 and Kv7.3 R230C channels, in response to the indicated voltage protocol. Current scale, 50 pA; time scale, 0.1 s. B, Conductance/voltage curves. Continuous lines are Boltzmann fits to the experimental data. Each data point is the mean ± SEM of 13–18 cells recorded in at least three separate experimental sessions. C, Western blot analysis of proteins from total lysates (top) or streptavidin-purified biotinylated plasma membrane fractions (bottom) from nontransfected CHO cells (NT) or from CHO cells transfected with Kv7.3, Kv7.3 A315T, or Kv7.3 R230C plasmids. In each panel, the higher and lower blots were probed with anti-Kv7.3 or anti-α-tubulin antibodies, as indicated. NT (t.l.) and Kv7.3 (t.l.) indicate the lanes corresponding to total lysates from nontransfected or Kv7.3-expressing cells, loaded on the gel-containing biotinylated proteins to visualize the molecular mass of Kv7.3 and α-tubulin. Numbers on the left correspond to the molecular masses of the protein marker. Quantitative analysis of the data is given in the text. To mimic the genetic condition of the affected patients, who carry a single mutant allele, and considering that IKM is mainly formed by heteromeric assembly of Kv7.2 and Kv7.3 subunits (Wang et al., 1998), the functional consequences of the described mutations were also assessed in heteromeric channels formed upon coexpression of Kv7.2 and/or Kv7.3 subunits. To this aim, CHO cells were transfected with Kv7.2+Kv7.3 cDNAs at a 1:1 ratio (to mimic the genetic balance of normal individuals), Kv7.2+Kv7.2 R201C+Kv7.3, Kv7.2+Kv7.2 R201H+Kv7.3, and Kv7.2+Kv7.2 R144Q+Kv7.3 at 0.5:0.5:1 ratio (to mimic the genetic balance of heterozygous individuals who carried mutant Kv7.2 alleles), or Kv7.2+ Kv7.3+ Kv7.3 R230C at 1:0.5:0.5 ratio (to mimic the genetic balance of the heterozygous individual carrying the mutant Kv7.3 allele). Compared with homomeric Kv7.2, heteromeric Kv7.2/3 channels displayed a reduced TEA sensitivity, a slight leftward shift of activation gating, and a drastic increase in maximal current density (Wang et al., 1998). Incorporation of Kv7.2 R201C, Kv7.2 R201H, or Kv7.3 R230C mutant subunits into heteromers prompted changes in channel gating that were similar, although quantitatively less dramatic, than those described in homomeric channels carrying mutant subunits (Fig. 4; Table 1). The resting membrane potential was significantly more negative in cells expressing heteromeric channels carrying mutant subunits than wild-type Kv7.2/3 channels, a result consistent with the reported hyperpolarizing shift in activation gating; as expected, changes in resting membrane potential among groups disappeared when the cells were depolarized using a higher (50 mm) extracellular K+ concentration (Table 1). Gating changes in triple heteromeric channels incorporating Kv7.2 R144Q subunits showed a similar, though statistically nonsignificant, trend (Table 1). In all cases, no changes in current size and TEA sensitivity were observed upon incorporation of mutant subunits, suggesting that these mutations failed to interfere with heteromeric subunit assembly (Table 1). Functional properties of heteromeric channels incorporating subunits carrying EE mutations. A, Macroscopic current traces from the indicated heteromeric channels in response to the indicated voltage protocol. Current scale, 200 pA; time scale, 0.1 s. Arrows indicate the threshold voltage (in mV) for current activation. Conductance/voltage curves for Kv7.2, Kv7.2+Kv7.3, Kv7.2+Kv7.2 R144Q+Kv7.3, Kv7.2+Kv7.2 R201C+Kv7.3, and Kv7.2+Kv7.2 R201H+Kv7.3 (B) or Kv7.3, Kv7.2+Kv7.3, and Kv7.2+Kv7.3 R230C+Kv7.3 (C). B, C, Continuous lines indicate Boltzmann fits of the experimental data. Current scale, 200 pA; time scale, 0.1 s. Each data point is the mean ± SEM of 6–12 cells recorded in at least three separate experimental sessions. Homomeric Kv7.2 channels may contribute to IKM diversity at some neuronal sites (Martire et al., 2004; Schwarz et al., 2006), particularly at early developmental stages (Devaux et al., 2004); therefore, the effects of each Kv7.2 mutation were also studied in heteromeric configuration with wild-type Kv7.2 subunits (1:1 ratio). Under this experimental condition, which generated a larger proportion of channels containing two mutant subunits, the gating changes observed were intermediate between homomeric (four mutant subunits) and triple heteromeric channels (one mutant subunit); the largest effect was observed when Kv7.2 R201C subunits were incorporated, whereas quantitatively smaller (but statistically significant) effects were observed upon incorporation of subunits carrying the R201H or R144Q mutations (Table 1). Similar results were also observed when mutant Kv7.2 subunits were coexpressed with Kv7.3, and when Kv7.3 R230C subunits were expressed with Kv7.2, suggesting that the observed gating changes were proportional to the number of mutant subunits incorporated into heteromeric channels (Table 1). As described, three of the four mutations herein investigated affect R2. To gain structural insights into the molecular mechanism by which this residue regulates gating in Kv7 channels, its electrostatic interactions were probed by multistate structural modeling; by this technique, structural models of six VSD gating states (activated, early deactivated, late deactivated, resting, early activated, and late activated) can be built based on long (>200 μs) molecular dynamic simulations of the Kv1.2/Kv2.1 chimera (Long et al., 2007) subjected to depolarizing and hyperpolarizing voltages (Jensen et al., 2012). The primary sequences of the VSDs of Kv7.2 and Kv7.3 are very similar; thus, only data for Kv7.2 are shown, but similar conclusions can be drawn for Kv7.3. Given the asymmetric structural transitions occurring in the four VSDs, Table 2 lists the electrostatic interactions involving R2 in each Kv7.2 subunit at all six gating states, whereas the structural models of the six states of the D subunit only are shown in Figure 5. 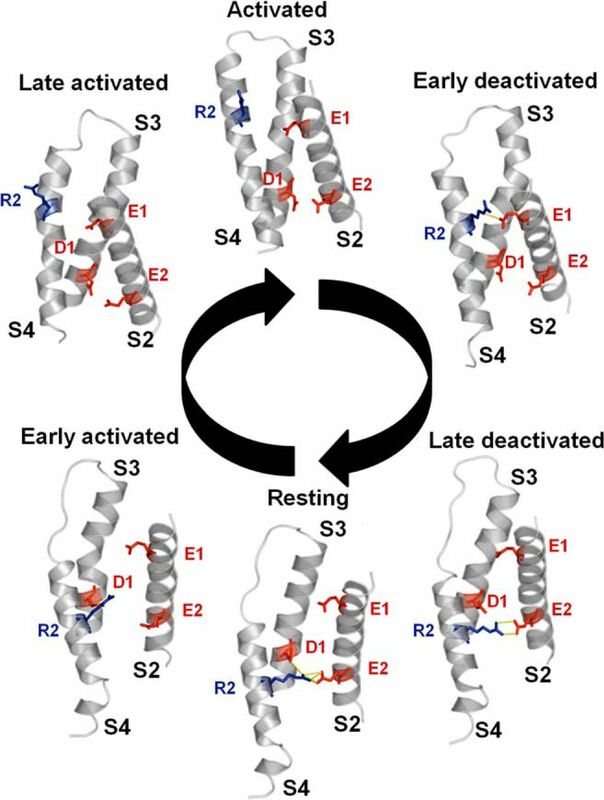 The results obtained suggest that R2 interacts differentially in each subunit with negatively charged residues E130 or E140 in S2, or D172 in S3 in the resting, early activated, late deactivated, or early deactivated state, whereas no interaction with these residues occurs when the VSD occupies the late activated and fully activated states. As expected (Long et al., 2007; Miceli et al., 2008, 2013), in the present model E130, E140, and D172, in addition to R2, also interact with other S4 positively charged residues in different gating states. Structural modeling of Kv7.2 VSD in six gating states. The structural model of six gating states (activated, early deactivated, late deactivated, resting, early activated, and late activated) of Kv7.2 VSD is shown. Red represents negatively charged E130 (E1), E140 (E2), and D172 (D1) residues. Blue represents positively charged R201 (R2) residue. Yellow represents electrostatic interactions. For clarity, only the S2, S3, and S4 transmembrane segments, and the S3–S4 interconnecting loop, are shown. To probe with functional experiments R2 interactions highlighted by multistate modeling, electrophysiological experiments were performed in cells expressing Kv7.2 channels where R2-interacting E130, E140, and D172 residues were substituted with positively charged (E130R, E140R, or D172R) or cysteine (E130C, E140C, or D172C) residues, alone or in combination with R201 charge reversal (E130R/R201E, E140R/R201E, and D172R/R201D), or cysteine introduction (E130C/R201C, E140C/R201C, and D172C/R201C); the occurrence of a specific interaction between mutated residues could be hypothesized when the functional properties of channels formed by these double-mutant subunits were different from those of either single mutant. Homomeric Kv7.2 channels carrying R201D or R201E mutations, similarly to R201C, elicited time- and voltage-independent currents (for Kv7.2 R201D and Kv7.2 R201E, the current densities were 53.1 ± 5.6 pA/pF and 27.7 ± 4.4 pA/pF, and the IInstant/Isteady-state ratios 0.98 ± 0.01 and 0.76 ± 0.02, respectively; n = 5–27), again suggesting that the positive charge at R2 is a critical voltage-sensing element (Miceli et al., 2008). Compared with Kv7.2, current activation from homomeric Kv7.2 E130R and E130C mutant channels was rightwardly shifted (the V½ were 59.5 ± 3.4 and 1.2 ± 0.2 mV, respectively; n = 7–8; p < 0.05 vs Kv7.2), whereas Kv7.2 E130R/R201E or Kv7.2 E130C/R201C double-mutant channels, similarly to Kv7.2 R201E and R201C, showed time- and voltage-independent gating (the IInstant/Isteady-state ratios were 0.93 ± 0.02 or 0.91 ± 0.02, respectively; n = 6–18); by contrast, all mutations involving the E140 residue (E140R, E140C, E140R/R201E, and E140C/R201C) were functionally silent (current densities at 0 mV were 0.8 ± 0.1, 0.2 ± 0.1, 0.6 ± 0.2, or 0.5 ± 0.1 pA/pF, respectively; n = 5–23; p > 0.05 vs untransfected CHO cells). Thus, no significant functional difference could be detected between E130/R2 or E140/R2 doubly mutated channels, and one of the single mutants. Instead, homomeric Kv7.2 D172R or D172C single mutant channels were functional (for Kv7.2 D172R and Kv7.2 D172C, the current densities were 13.2 ± 2.2 pA/pF and 54.7 ± 13 pA/pF; n = 9–14), although their activation gating was rightwardly shifted (the V½ were −11.9 ± 1.5 and −4 ± 1.3 mV for Kv7.2 D172R and Kv7.2 D172C, respectively; n = 9–14; p < 0.05 vs Kv7.2), whereas Kv7.2 D172R/R201D and D172C/R201C double-mutant channels were nonfunctional (current densities at 0 mV were 1.1 ± 0.2 and 0.3 ± 0.1 pA/pF, respectively; n = 8–20; p > 0.05 vs untransfected CHO cells), despite being expressed at the plasma membrane similarly to Kv7.2 subunits. Indeed, the ODQ2-TOTAL/ODTUB ratios were 1.00 ± 0.14, 1.17 ± 0.11, and 0.84 ± 0.14 for Kv7.2, Kv7.2 D172R/R201D, and Kv7.2 D172C/R201C, respectively; and the ODQ2-BIOT/ODQ2-TOTAL ratios were 1.06 ± 0.24, 0.94 ± 0.25, and 0.66 ± 0.09 for Kv7.2, Kv7.2 D172R/R201D, and Kv7.2 D172C/R201C, respectively (n = 3; p > 0.05) (Fig. 6A). The fact that D172R/R201D or Kv7.2 D172C/R201C subunits are present in the plasma membrane fraction but are unable to form functional channels, whereas D172R, D172C, R201D, or R201C channels all carry large currents, is suggestive of a possible VSD resting state hyperstabilization caused by a newly formed intrasubunit interaction. Membrane expression of Kv7.2 D172R/R201D and D172C/R201C channels, and effects of reducing/oxidizing agents on Kv7.2 cysteine-substituted channels. A, Western blot analysis of proteins from total lysates (left) or streptavidin-purified biotinylated plasma membrane fractions (right) from untransfected CHO cells (NT) or from CHO cells expressing Kv7.2 (WT), Kv7.2 D172R/R201D (DR/RD), or D172C/R201C (DR/CC) subunits. In each panel, the higher and lower blots were probed with anti-Kv7.2 or anti-α-tubulin antibodies, as indicated. NT (t.l.) and WT (t.l.) indicate the lanes corresponding to total lysates from nontransfected (NT) or Kv7.2-expressing (WT) cells, loaded on the gel containing biotinylated proteins to visualize the molecular mass of Kv7.2 and α-tubulin. Numbers on the left correspond to the molecular masses of the protein marker. Quantitative analysis of the data is given in the text. B, Superimposed traces of current responses evoked by a 0 mV pulse from a CHO cell transfected with the plasmid encoding for Kv7.2 D172C/R201C subunits in control condition (CTL; black trace) or from another cell of the same experimental group after treatment with DTT (1 mm, red trace). Green trace represents the current response from the same DTT-treated Kv7.2 D172C/R201C-expressing cell shown in red during exposure to TEA (3 mm) and subsequent washout. Bar at bottom represents the duration of TEA exposure. Current scale, 20 pA; time scale, 0.5 s. C, Quantification of current densities and effect of DTT (1 mm), H2O2 (0.5 mm), and DTT + H2O2 from the indicated channels. *p < 0.05, significantly different from the respective control. N = 4–10 cells per group recorded in at least three separate experimental sessions. To challenge this hypothesis, we studied the effects of the strong reducing agent and disulfide bond breaker dithiothreitol (DTT) in Kv7.2 D172C/R201C channels. Treatment for 1 h of cells expressing nonfunctional Kv7.2 D172C/R201C double-mutant channels with DTT (1 mm) elicited a small but detectable current upon depolarization to 0 mV (Fig. 6B); this current was almost fully (85.4 ± 3.4% of inhibition; n = 3) and reversibly blocked by 3 mm TEA (Fig. 6B). 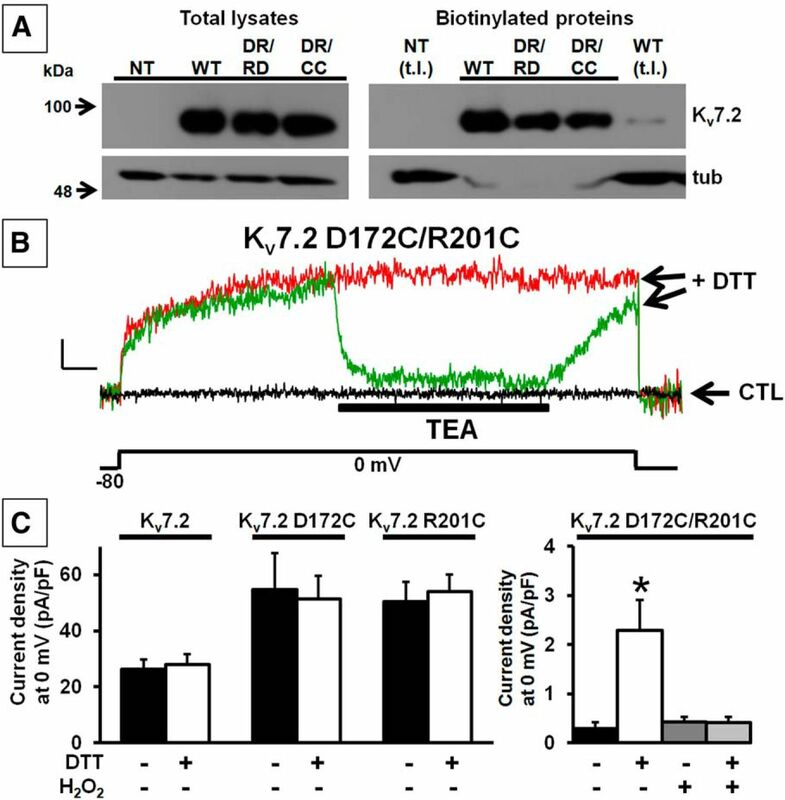 The effect of DTT was highly specific for the double mutant, as either Kv7.2, Kv7.2 D172C or R201C single mutant channels were insensitive to DTT (Fig. 6C). H2O2 (500 μm) fully reversed DTT-induced current increase in Kv7.2 D172C/R201C channels. These data provide functional evidence for the occurrence of a disulfide bond when cysteines occupy both the 172 and 201 positions, suggesting that electrostatic interactions between these residues are likely to occur in native Kv7.2 channels. By contrast, treatment with retigabine (10 μm), despite promoting channel opening allosterically, failed to recover currents from Kv7.2 D172R/R201D channels; indeed, the current density at 0 mV was 0.5 + 0.2 pA/pF before drug exposure (control) and 0.5 + 0.2 pA/pF upon retigabine exposure (n = 5 cells; p > 0.05). To test the possible mechanisms underlying the Kv7.2/3 mutation-induced increase in excitability, we first tested intrinsic cell properties using a realistic model of a hippocampal principal neuron. An increase in a K+ current, such as IKM, results in a hyperpolarization of the resting membrane potential, which may increase the availability of Na+ channels. In our CA1 model cell, the hyperpolarization induced by IKM was 0.21 and 0.63 mV for wild-type (Kv7.2+Kv7.3) and mutant (Kv7.2+Kv7.2 R201C+Kv7.3) IKM, respectively. This effect may be particularly important for CA1 during a train of action potentials because, in these cells, dendritic Na+ channels exhibit slow inactivation with a strong voltage dependence (Spruston et al., 1995). In principle, thus, the larger hyperpolarization generated by a mutant IKM can increase cell's excitability. This effect is illustrated by the simulations in Fig. 7A. Under control conditions (Fig. 7A, blue trace, wild-type IKM), a few spikes were elicited at the beginning of the simulation; as soon as the dendritic Na+ channels inactivate (after ∼100 ms) the cell stops firing. However, a hyperpolarizing current (Fig. 7A, red trace, −4 nA) rescued Na+ channels from the inactivated state, and a few more spikes were elicited at the end of the current injection. Because the mutant IKM hyperpolarized the somatic resting potential by only 0.43 mV, additional Na+ channel repriming was marginal (Fig. 7A, black trace), and increasing the IKM peak conductance resulted in qualitatively similar effects (data not shown). The model thus suggests that an increased availability of Na+ channels does not appear to be responsible for an increased excitability of hippocampal CA1 pyramidal cells. A computational model suggests the possible physiological mechanism for the increase in CA1 excitability following a GOF mutation of IKM. A, Increased Na+ channel availability may not account for the increase in excitability; traces are from simulations under control conditions, using wild-type IKM (Kv7.2+Kv7.3, blue), control conditions with a −4 nA hyperpolarizing current injection (red), and with mutant IKM channels (Kv7.2+Kv7.2 R201C+Kv7.3, black). Dashed line indicates the resting potential, set at −65 mV; the same synaptic stimulation pattern was used for all cases. B, Left, The microcircuit used to test the effects of a mutant IKM: an input activates excitatory synapses (closed circles) on the CA1 pyramidal neuron and, with a 3 ms delay, on the interneuron; somatic spikes of the interneuron activate an inhibitory synapse (open circle) on the soma of the CA1 cell. Right, Relative change in the number of CA1 action potentials elicited as a function of the average input frequency and the peak excitatory conductance on the interneuron. ★Case shown in detail in C. C, Somatic membrane potential for the two cells in the simulations indicated in B (☆). There is large hyperpolarization of the interneuron caused by the mutant IKM (green). We next tested a feedforward inhibitory microcircuit, implemented as shown in Fig. 7B (left). The rationale for this choice is that the intrinsic properties of different cells can be differentially affected by the same Kv7.2/3-IKM mutation. To test this hypothesis, we explored different combinations for the average excitatory input frequency and the peak excitatory conductance activating the interneuron, whereas the peak inhibitory conductance on the CA1 was fixed at 150 nS, corresponding to the synchronous activation of ∼30–100 inhibitory synapses (Bertrand and Lacaille, 2001). For the combination of parameters indicated in Figure 7B (right, star), incorporating of the experimentally defined parameters for mutant IKM resulted in a 190% increase in the number of action potentials elicited in the pyramidal neuron. This difference depends on the interneuron activity. A weaker activation will result in a smaller difference between wild-type and mutant IKM (Fig. 7B, green area in the plot), whereas a stronger interneuron activation will make the effect of the mutation less important and the CA1 will appear less excitable (Fig. 7B, orange areas in the plot). As shown in Figure 7C, under control conditions (blue and red traces), the interneuron activity blocks more than half of the action potentials that would be generated by the excitatory input on CA1. However, in the presence of a mutated IKM (green and black traces), the resting potential of the interneuron will be much more hyperpolarized with respect to that with wild-type IKM (8.63 vs 3.16 mV, compare green and black membrane potential at the beginning of the simulation in Fig. 7C), an effect directly related to the higher input resistance of the interneuron. This larger hyperpolarization limits the interneuron activation and results in an effective disinhibition of the principal cell, which now appears as more excitable. Because in hippocampal interneurons IKM appears to be also expressed in dendrites (Lawrence et al., 2006), we also tested a uniform somatodendritic expression of IKM in the dendrites of the interneuron. The results (data not shown) were qualitatively similar to those obtained with the somatic only expression, and implicitly confirm the robustness of the observed effect. Together, these results suggest that a GOF mutation in Kv7.2/3-IKM can increase the (apparent) excitability of hippocampal CA1 pyramidal neurons by altering network interactions rather than the intrinsic cell properties. Kv7.2 and, to a lesser degree, Kv7.3 mutations have been associated with a wide phenotypic spectrum of epileptic disorders, ranging from BFNS to early-onset EEs. In the present work, we studied the functional consequences of three Kv7.2 and one Kv7.3 de novo mutations found by classical Sanger sequencing (R201C in Kv7.2; Weckhuysen et al., 2013), targeted gene resequencing (R201H in Kv7.2; Carvill et al., 2013), or whole-exome sequencing (R144Q in Kv7.2 and R230C in Kv7.3; Allen et al., 2013) in individuals affected with various forms of EEs; notably, a child with nonsyndromic intellectual disability and multifocal epileptic activity also carried the R230C variant in Kv7.3 (Rauch et al., 2012), confirming the tight genetic interconnection between EEs and intellectual disability and/or autism spectrum disorders (Novarino et al., 2013). Notably, the R144Q mutation occurs in a patient who did not suffer from neonatal seizures but rather showed infantile spasms with a later (6 months) age of onset (Allen et al., 2013). Both in homomeric or heteromeric configuration with Kv7.2/3 subunits, the mutations herein investigated increased channel sensitivity to voltage, without major changes in pore properties, heteromerization, and/or membrane expression. Indeed, current activation midpoint in homomeric Kv7.2 R144Q channels, which neutralized a highly conserved R at the bottom of S2, was hyperpolarized by ∼20 mV. By contrast, homomeric channels formed by Kv7.2 R201C or Kv7.3 R230C subunits, in which the crucial gating residue R2 was replaced by a mostly neutral C, displayed a marked loss in voltage-dependent gating. The fact that the gating changes of Kv7.2 R201H channels were quantitatively smaller than those of R201C channels is consistent with the notion that the removal of the positive charge is in itself responsible for the observed gating alterations; indeed, under physiological pH, histidines are mostly uncharged (pKa is ∼6), but a small percentage could be protonated, whereas cysteines, having a pKa of ∼8.4, are partly (10%) deprotonated and negatively charged. In keeping with this hypothesis, R201D and R201E, similarly to R201Q Kv7.2 channels (Miceli et al., 2008), also carried time- and voltage-independent currents. Neutralization of the corresponding position in Kv7.1 (Panaghie and Abbott, 2007) or Kv7.4 (Miceli et al., 2012) led to similar gating changes. Single-channel measurements in Kv7.2 R201Q channels (Miceli et al., 2008) showed that this mutation affected the conformational changes involving deeper, nonconducting closed states, where most of the voltage-dependent transitions occur (Zagotta and Aldrich, 1990). Multistate molecular modeling revealed that R2 forms ionized hydrogen bonds with different negatively charged residues (E130 and E140 in S2, D172 in S3) in distinct states along the activation/deactivation trajectories of each subunit. No ionized hydrogen bond involving R2 can be detected in the fully activated and late activated states, whereas significant electrostatic interactions occur in the resting and nearby states. Thus, mutations substituting R2 with mostly uncharged H or C residues would preferentially weaken the stability of the resting, fully deactivated state of the VSD, without significantly compromising that of the activated state; consistent with our functional data, this stability shift toward the activated state would allow the channels to be more easily opened by voltage, with a significant fraction being already active at hyperpolarized membrane potentials. Disulfide trapping experiments showed that Kv7.2 D172C/R201C channels were rescued from nonfunctional to active upon DTT reduction, an effect reverted by H2O2 and requiring the simultaneous presence of C residues at both these positions. Given that side chains thiols can form a disulfide bond when the distance between their Cβ atoms reaches ∼4.6 Å (although this value is critically dependent on protein flexibility) (Careaga and Falke, 1992), these data provide functional evidence for the occurrence of an ionized hydrogen bond between D172 and R201 stabilizing the resting state of the VSD in Kv7.2. Mutations in Kv7.2/3 responsible for both familial and sporadic cases of BFNS decrease channel function by several mechanisms, including gating defects (Dedek et al., 2001; Castaldo et al., 2002; Soldovieri et al., 2007), decreased subunit stability (Soldovieri et al., 2006), altered subcellular targeting (Chung et al., 2006; Liu and Devaux, 2014), or defective regulation by calmodulin (Cavaretta et al., 2014) or syntaxin-1A (Soldovieri et al., 2014). The main conclusion from the present study is that, in addition to dramatic functional deficits (Miceli et al., 2013), in some cases with dominant-negative consequences (Orhan et al., 2014), de novo mutations found in EE patients can also enhance Kv7.2/3 channel function. Epilepsy-causing GOF mutations in K+ channel genes have been reported previously, as in the case of KCNMA1 encoding for the α-subunit of large conductance calcium-sensitive (BK) channels (Du et al., 2005), of KCNJ10 encoding for the inwardly rectifying KIR4.1 channel (Sicca et al., 2011), and of KCND2 encoding for the A-type channel Kv4.2 (Lee et al., 2014). Moreover, an increased voltage sensitivity favoring channel opening is caused by the Kv10.2 (KCNH5) R327H mutation (also affecting the VSD R2 residue) (Yang et al., 2013) found in children with EE and autistic features (Veeramah et al., 2013), and constitutive channel activation characterizes KCNT1 mutations occurring in malignant migrating partial seizures of infancy (Barcia et al., 2012); in KCNT1 mutants, treatment with quinidine restored normal channel function, highlighting novel therapeutic strategies for malignant migrating partial seizures of infancy (Milligan et al., 2014). Several pathophysiological mechanisms have been proposed to explain the apparently paradoxical increase in brain excitability caused by GOF mutations in K+ channels; although KIR4.1 mutations may trigger a recurrent neuron-astrocyte-neuron excitatory loop (Sicca et al., 2011), hyperactivation of BK channels would enable higher firing frequencies in excitatory neurons because of faster action potential repolarization and sodium channel repriming (Du et al., 2005). Alternatively, an increased function of subthreshold K+ channels, such as IKM (Hu et al., 2009; Nigro et al., 2014), may overactivate the hyperpolarization-activated nonselective cation current Ih (Robinson and Siegelbaum, 2003), resulting in secondary depolarizations. The present computational modeling experiments suggest that an increased function of IKM is unable to increase principal neuron excitability by Na+ channels repriming because the increase in the Na+ channels availability is not sufficient to counterbalance the mutation-induced hyperpolarization; instead, because of the larger input resistance observed in interneurons compared with principal neurons (Foster and Dumas, 2001; Lamsa et al., 2007; Zemankovics et al., 2010), a negative shift in IKM would preferentially affect the inhibitory interneuron, thereby leading to an increased excitability of the principal neuron. Although compensatory homeostatic mechanisms, such as the relocation of the axon initial segment (Harty et al., 2013) should also be taken into account, an impairment in the delicate balance between excitation and inhibition in hippocampal CA1 pyramidal neurons seems to contribute to the epileptic phenotype. Therefore, Kv7 GOF mutations can affect hippocampal theta oscillation involved in cognitive processes, such as learning and memory, which depends on IKM function through the so-called somatic M-resonance (Hu et al., 2009). Noteworthy, selective silencing of inhibitory interneurons also occurs in epileptic channelopathies caused by SCN1A LOF mutations (Catterall et al., 2010). The present results reveal that complex network properties, rather than intrinsic properties of isolated principal neurons (Miceli et al., 2013), contribute to cellular hyperexcitability by IKM GOF mutations, suggesting that reducing or enhancing IKM may trigger epileptogenesis by different pathophysiological mechanisms. Similarly, although most de novo mutations in the Ih-encoding HCN1 gene occurring in patients with infantile EE cause GOF effects, few promoted LOF, and both decreases or increases in Ih have been suggested as pathogenic in vivo (Nava et al., 2014). Kv7 channels may serve contrasting functional roles depending on their subcellular localization (Kole and Cooper, 2014). Indeed, whereas perisomatic Kv7 channels counteract the persistent Nav current and restrain repetitive firing, Kv7 channels in nodes of Ranvier of neocortical (Battefeld et al., 2014) and hippocampal (Vervaeke et al., 2006) neurons, in addition to preventing aberrant spontaneous firing, can also increase Nav channel availability and action potential amplitude by hyperpolarizing the resting membrane potential and removing Nav inactivation; thus, Kv7.2/3 mutations may differentially affect neuronal excitability in a context-dependent manner because of differences in intrinsic biophysical properties or modulation by regulatory partners at each subcellular site. The present results do not cover the full spectrum of possible mechanisms of mutation-induced channel dysfunction; thus, caution should be exercised if these are used to formulate hypotheses on disease pathogenesis. Indeed, the KIR3.2 mutation responsible for the weaver phenotype in mice promoted GOF effects when channels were expressed heterologously but impaired channel trafficking and function in vivo (Kofuji et al., 1996; Rossi et al., 1998). Nonetheless, because highly sensitive genome sequencing techniques are likely to be introduced in routine clinical practice in the near future, the interpretation of the pathogenic role of specific gene variants and genotype-phenotype correlations will have a significant impact not only on disease diagnosis, but also for patient-tailored prognostic and therapeutic approaches. The present description of Kv7.2/3 GOF mutations associated with EEs reveals a previously unexplored level of complexity in disease pathogenesis, which requires special attention when investigating the effect of Kv7 modulators on cognitive and other neurodevelopmental outcomes (Weckhuysen et al., 2012; Miceli et al., 2013; Orhan et al., 2014). This work was supported by Telethon Grant GGP07125, the Fondazione San Paolo-IMI (Project Neuroscience), Regione Molise (Convenzione AIFA/Regione Molise), the Science and Technology Council of the Province of Avellino, Grant PRIN 2009 to M.T., and the Fondazione Umberto Veronesi to F.M. We thank Dr. Thomas J. Jentsch, Department of Physiology and Pathology of Ion Transport, Leibniz-Institut für Molekulare Pharmakologie, Berlin for sharing Kv7.2 and Kv7.3 cDNAs; Dr. Alvaro Villarroel, Unidad de Biofisica, UPV-CSIC, Leioa, Spain for sharing Kv7.3 A315T cDNA; Dr. David E. Shaw, D.E. Shaw Research, New York, for the coordinates of the Kv1.2/2.1 chimera. F.M. and M.V.S. are supported by postdoctoral fellowships from the Department of Neuroscience, University of Naples Federico II, Naples, and from the Italian Society for Pharmacology, respectively. (2013) De novo mutations in epileptic encephalopathies. Nature 501:217–221, doi:10.1038/nature12439, pmid:23934111. (2012) De novo gain-of-function KCNT1 channel mutations cause malignant migrating partial seizures of infancy. Nat Genet 44:1255–1259, doi:10.1038/ng.2441, pmid:23086397. (2014) Heteromeric Kv7.2/7.3 channels differentially regulate action potential initiation and conduction in neocortical myelinated axons. J Neurosci 34:3719–3732, doi:10.1523/JNEUROSCI.4206-13.2014, pmid:24599470. (2001) Unitary synaptic currents between lacunosum-moleculare interneurones and pyramidal cells in rat hippocampus. J Physiol 532:369–384, doi:10.1111/j.1469-7793.2001.0369f.x, pmid:11306657. (1998) A potassium channel mutation in neonatal human epilepsy. Science 279:403–406, doi:10.1126/science.279.5349.403, pmid:9430594. (2004) A novel mutation in KCNQ2 associated with BFNC, drug resistant epilepsy, and mental retardation. Neurology 63:57–65, doi:10.1212/01.WNL.0000132979.08394.6D, pmid:15249611. (1992) Thermal motions of surface alpha-helices in the d-galactose chemosensory receptor: detection by disulfide trapping. J Mol Biol 226:1219–1235, doi:10.1016/0022-2836(92)91063-U, pmid:1518053. (2013) Targeted resequencing in epileptic encephalopathies identifies de novo mutations in CHD2 and SYNGAP1. Nat Genet 45:825–830, doi:10.1038/ng.2646, pmid:23708187. (2002) Benign familial neonatal convulsions caused by altered gating of KCNQ2/KCNQ3 potassium channels. J Neurosci 22:RC199, pmid:11784811. (2004) A novel hyperekplexia-causing mutation in the pre-transmembrane segment 1 of the human glycine receptor alpha1 subunit reduces membrane expression and impairs gating by agonists. J Biol Chem 279:25598–25604, doi:10.1074/jbc.M311021200, pmid:15066993. (2010) NaV1.1 channels and epilepsy. J Physiol 588:1849–1859, doi:10.1113/jphysiol.2010.187484, pmid:20194124. (2014) Polarized axonal surface expression of neuronal KCNQ potassium channels is regulated by calmodulin interaction with KCNQ2 subunit. PLoS One 9:e103655, doi:10.1371/journal.pone.0103655, pmid:25077630. (1998) A pore mutation in a novel KQT-like potassium channel gene in an idiopathic epilepsy family. Nat Genet 18:53–55, doi:10.1038/ng0198-53, pmid:9425900. (2006) Polarized axonal surface expression of neuronal KCNQ channels is mediated by multiple signals in the KCNQ2 and KCNQ3 C-terminal domains. Proc Natl Acad Sci U S A 103:8870–8875, doi:10.1073/pnas.0603376103, pmid:16735477. (2013) The epileptic encephalopathies. Handb Clin Neurol 111:619–626, doi:10.1016/B978-0-444-52891-9.00064-6, pmid:23622209. (2001) Myokymia and neonatal epilepsy caused by a mutation in the voltage sensor of the KCNQ2 K+ channel. Proc Natl Acad Sci U S A 98:12272–12277, doi:10.1073/pnas.211431298, pmid:11572947. (2004) KCNQ2 is a nodal K+ channel. J Neurosci 24:1236–1244, doi:10.1523/JNEUROSCI.4512-03.2004, pmid:14762142. (2005) Calcium-sensitive potassium channelopathy in human epilepsy and paroxysmal movement disorder. Nat Genet 37:733–738, doi:10.1038/ng1585, pmid:15937479. (2001) Mechanism for increased hippocampal synaptic strength following differential experience. J Neurophysiol 85:1377–1383, pmid:11287462. (2013) Axon initial segment structural plasticity in animal models of genetic and acquired epilepsy. Epilepsy Res 105:272–279, doi:10.1016/j.eplepsyres.2013.03.004, pmid:23602553. (1997) The NEURON simulation environment. Neural Comput 9:1179–1209, doi:10.1162/neco.1997.9.6.1179, pmid:9248061. (2002) Two forms of electrical resonance at theta frequencies, generated by M-current, h-current and persistent Na current in rat hippocampal pyramidal cells. J Physiol 545:783–805, doi:10.1113/jphysiol.2002.029249, pmid:12482886. (2009) Complementary theta resonance filtering by two spatially segregated mechanisms in CA1 hippocampal pyramidal neurons. J Neurosci 29:14472–14483, doi:10.1523/JNEUROSCI.0187-09.2009, pmid:19923281. (2012) Mechanism of voltage gating in potassium channels. Science 336:229–233, doi:10.1126/science.1216533, pmid:22499946. (2000) Neuronal KCNQ potassium channels: physiology and role in disease. Nat Rev Neurosci 1:21–30, doi:10.1038/35036198, pmid:11252765. (2013) Clinical spectrum of early onset epileptic encephalopathies caused by KCNQ2 mutation. Epilepsia 54:1282–1287, doi:10.1111/epi.12200, pmid:23621294. (1996) Functional analysis of the weaver mutant GIRK2 K+ channel and rescue of weaver granule cells. Neuron 16:941–952, doi:10.1016/S0896-6273(00)80117-8, pmid:8630252. (2014) Axonal Kv7.2/7.3 channels: caught in the act. Channels 8:288–289, doi:10.4161/chan.29965, pmid:25171180. (2007) NMDA receptor-dependent long-term potentiation in mouse hippocampal interneurons shows a unique dependence on Ca2+/calmodulin-dependent kinases. J Physiol 584:885–894, doi:10.1113/jphysiol.2007.137380, pmid:17884930. (2006) Somatodendritic Kv7/KCNQ/M channels control interspike interval in hippocampal interneurons. J Neurosci 26:12325–12338, doi:10.1523/JNEUROSCI.3521-06.2006, pmid:17122058. (2014) Exome sequencing identifies de novo gain of function missense mutation in KCND2 in identical twins with autism and seizures that slows potassium channel inactivation. Hum Mol Genet 23:3481–3489, doi:10.1093/hmg/ddu056, pmid:24501278. (2014) Calmodulin orchestrates the heteromeric assembly and the trafficking of KCNQ2/3 (Kv7.2/3) channels in neurons. Mol Cell Neurosci 58:40–52, doi:10.1016/j.mcn.2013.12.005, pmid:24333508. (2007) Atomic structure of a voltage-dependent K+ channel in a lipid membrane-like environment. Nature 450:376–382, doi:10.1038/nature06265, pmid:18004376. (2009) H channel-dependent deficit of theta oscillation resonance and phase shift in temporal lobe epilepsy. Neurobiol Dis 33:436–447, doi:10.1016/j.nbd.2008.11.019, pmid:19135151. 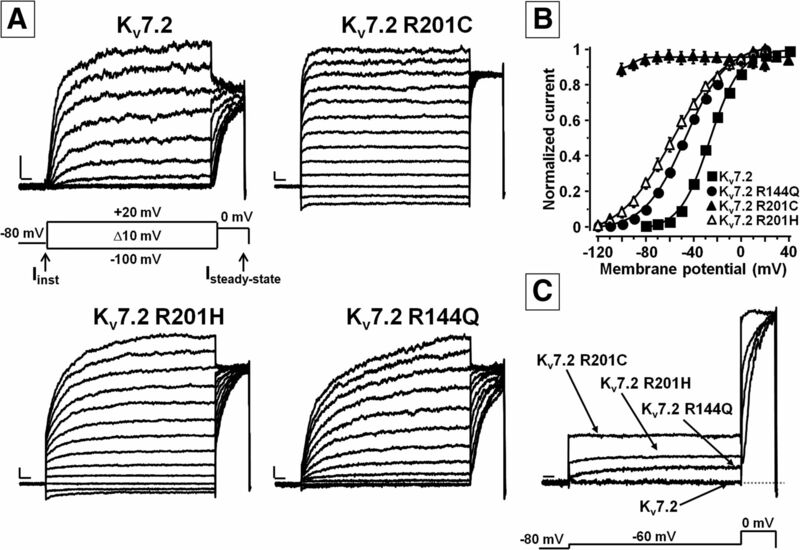 (2004) M channels containing KCNQ2 subunits modulate norepinephrine, aspartate, and GABA release from hippocampal nerve terminals. J Neurosci 24:592–597, doi:10.1523/JNEUROSCI.3143-03.2004, pmid:14736843. 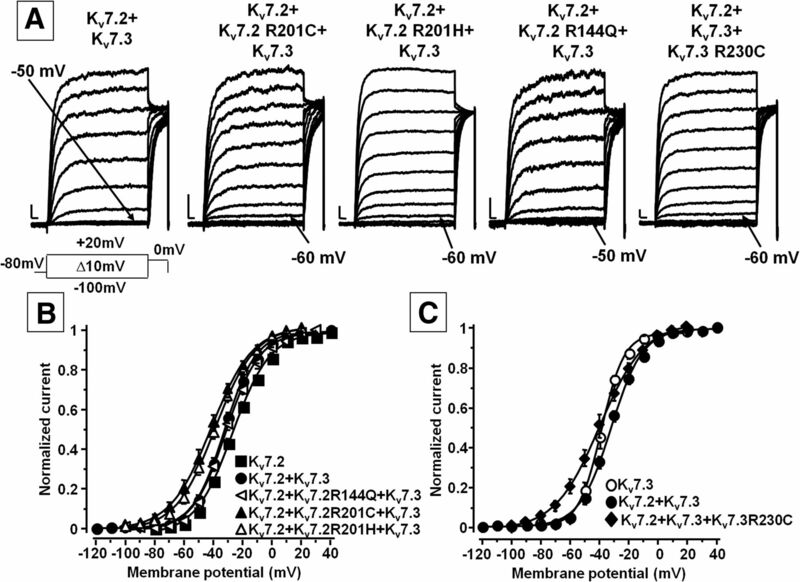 (2008) Gating consequences of charge neutralization of arginine residues in the S4 segment of K(v)7.2, an epilepsy-linked K+ channel subunit. Biophys J 95:2254–2264, doi:10.1529/biophysj.107.128371, pmid:18515377. (2012) Gating currents from Kv7 channels carrying neuronal hyperexcitability mutations in the voltage-sensing domain. Biophys J 102:1372–1382, doi:10.1016/j.bpj.2012.02.004, pmid:22455920. (2013) Genotype-phenotype correlations in neonatal epilepsies caused by mutations in the voltage sensor of K(v)7.2 potassium channel subunits. Proc Natl Acad Sci U S A 110:4386–4391, doi:10.1073/pnas.1216867110, pmid:23440208. (2003) On the integration of subthreshold inputs from perforant path and Schaffer collaterals in hippocampal CA1 pyramidal neurons. J Comput Neurosci 14:185–192, doi:10.1023/A:1021906818333, pmid:12567016. (2005) Signal propagation in oblique dendrites of CA1 pyramidal cells. J Neurophysiol 94:4145–4155, doi:10.1152/jn.00521.2005, pmid:16293591. (2014) KCNT1 gain of function in 2 epilepsy phenotypes is reversed by quinidine. Ann Neurol 75:581–590, doi:10.1002/ana.24128, pmid:24591078. (2007) Signaling properties of stratum oriens interneurons in the hippocampus of transgenic mice expressing EGFP in a subset of somatostatin-containing cells. Hippocampus 17:538–553, doi:10.1002/hipo.20291, pmid:17455332. (2014) De novo mutations in HCN1 cause early infantile epileptic encephalopathy. Nat Genet 46:640–645, doi:10.1038/ng.2952, pmid:24747641. (2014) Expression and functional roles of Kv7/KCNQ/M-channels in rat medial entorhinal cortex layer II stellate cells. J Neurosci 34:6807–6812, doi:10.1523/JNEUROSCI.4153-13.2014, pmid:24828634. (2013) The sacred disease: the puzzling genetics of epileptic disorders. Neuron 80:9–11, doi:10.1016/j.neuron.2013.09.019, pmid:24094099. (2014) Dominant-negative effects of KCNQ2 mutations are associated with epileptic encephalopathy. Ann Neurol 75:382–394, doi:10.1002/ana.24080, pmid:24318194. (2007) The role of S4 charges in voltage-dependent and voltage-independent KCNQ1 potassium channel complexes. J Gen Physiol 129:121–133, doi:10.1085/jgp.200609612, pmid:17227916. (2012) Range of genetic mutations associated with severe non-syndromic sporadic intellectual disability: an exome sequencing study. Lancet 380:1674–1682, doi:10.1016/S0140-6736(12)61480-9, pmid:23020937. (2003) Hyperpolarization-activated cation currents: from molecules to physiological function. Annu Rev Physiol 65:453–480, doi:10.1146/annurev.physiol.65.092101.142734, pmid:12471170. (1998) The weaver mutation causes a loss of inward rectifier current regulation in premigratory granule cells of the mouse cerebellum. J Neurosci 18:3537–3547, pmid:9570785. (2012) Whole exome sequencing identifies KCNQ2 mutations in Ohtahara syndrome. Ann Neurol 72:298–300, doi:10.1002/ana.23620, pmid:22926866. (2006) KCNQ channels mediate IKs, a slow K+ current regulating excitability in the rat node of Ranvier. J Physiol 573:17–34, doi:10.1113/jphysiol.2006.106815, pmid:16527853. 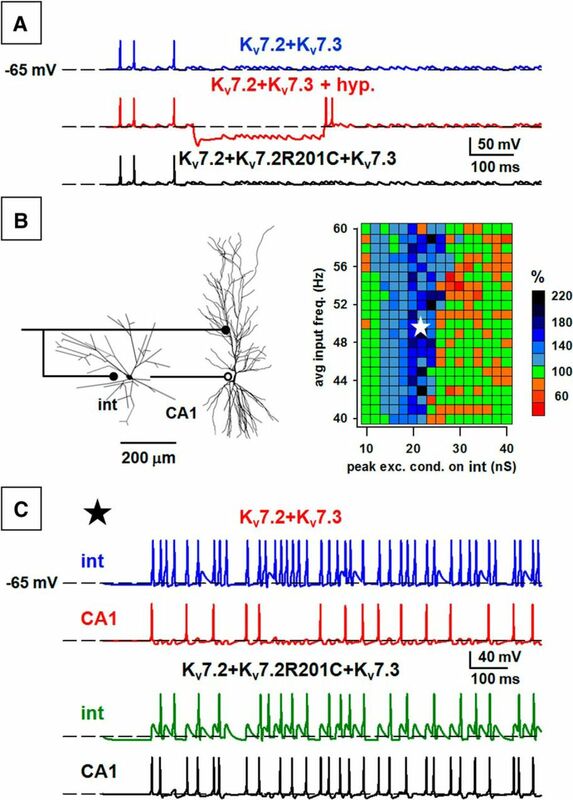 (2008) Functional significance of axonal Kv7 channels in hippocampal pyramidal neurons. Proc Natl Acad Sci U S A 105:7869–7874, doi:10.1073/pnas.0802805105, pmid:18515424. (2011) Autism with seizures and intellectual disability: possible causative role of gain-of-function of the inwardly-rectifying K+ channel Kir4.1. Neurobiol Dis 43:239–247, doi:10.1016/j.nbd.2011.03.016, pmid:21458570. (1998) A novel potassium channel gene, KCNQ2, is mutated in an inherited epilepsy of newborns. Nat Genet 18:25–29, doi:10.1038/ng0198-25, pmid:9425895. (2008) Mouse models of human KCNQ2 and KCNQ3 mutations for benign familial neonatal convulsions show seizures and neuronal plasticity without synaptic reorganization. J Physiol 586:3405–3423, doi:10.1113/jphysiol.2008.154971, pmid:18483067. (2006) Decreased subunit stability as a novel mechanism for potassium current impairment by a KCNQ2 C terminus mutation causing benign familial neonatal convulsions. J Biol Chem 281:418–428, doi:10.1074/jbc.M510980200, pmid:16260777. (2007) Atypical gating of M-type potassium channels conferred by mutations in uncharged residues in the S4 region of KCNQ2 causing benign familial neonatal convulsions. J Neurosci 27:4919–4928, doi:10.1523/JNEUROSCI.0580-07.2007, pmid:17475800. (2014) Novel KCNQ2 and KCNQ3 mutations in a large cohort of families with benign neonatal epilepsy: first evidence for an altered channel regulation by syntaxin-1A. Hum Mutat 35:356–367, doi:10.1002/humu.22500, pmid:24375629. (1995) Activity dependent action potential invasion and calcium influx into hippocampal CAl dendrites. Science 268:297–300, doi:10.1126/science.7716524, pmid:7716524. (2007) Benign familial neonatal convulsions: always benign? Epilepsy Res 73:245–249, doi:10.1016/j.eplepsyres.2006.10.010, pmid:17129708. (2013) Genetic epileptic encephalopathies: is all written into the DNA? Epilepsia 54(Suppl 8):22–26. (2013) Exome sequencing reveals new causal mutations in children with epileptic encephalopathies. Epilepsia 54:1270–1281, doi:10.1111/epi.12201, pmid:23647072. (2006) Kv7/KCNQ/M-channels in rat glutamatergic hippocampal axons and their role in regulation of excitability and transmitter release. J Physiol 576:235–256, doi:10.1113/jphysiol.2006.111336, pmid:16840518. (1998) KCNQ2 and KCNQ3 potassium channel subunits: molecular correlates of the M-channel. Science 282:1890–1893, doi:10.1126/science.282.5395.1890, pmid:9836639. (2012) KCNQ2 encephalopathy: emerging phenotype of a neonatal epileptic encephalopathy. Ann Neurol 71:15–25, doi:10.1002/ana.22644, pmid:22275249. (2013) Extending the KCNQ2 encephalopathy spectrum: clinical and neuroimaging findings in 17 patients. Neurology 81:1697–1703, doi:10.1212/01.wnl.0000435296.72400.a1, pmid:24107868. (2013) Multistate structural modeling and voltage-clamp analysis of epilepsy/autism mutation Kv10.2-R327H demonstrate the role of this residue in stabilizing the channel closed state. J Neurosci 33:16586–16593, doi:10.1523/JNEUROSCI.2307-13.2013, pmid:24133262. (1990) Voltage-dependent gating of Shaker A-type potassium channels in Drosophila muscle. J Gen Physiol 95:29–60, doi:10.1085/jgp.95.1.29, pmid:2299331. (2008) Determinants within the turret and pore-loop domains of KCNQ3 K+ channels governing functional activity. Biophys J 95:5121–5137, doi:10.1529/biophysj.108.137604, pmid:18790849.